New drilling results from the Triumph gold project in Queensland have added considerable weight to Metal Bank’s dual-focused exploration approach and thesis in a region of multi-million-ounce intrusive gold deposits. Metal Bank managing director Tony Schreck explains why. 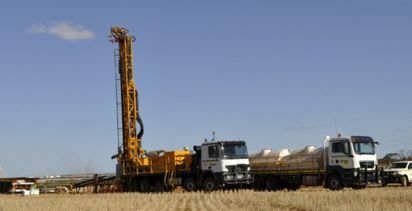 RESOURCEStocks: We spoke recently about your "parallel exploration" approach this year at the Triumph project in a part of Queensland known for its big intrusion-related gold systems (Mt Rawdon, Kidston, Mt Leyshon, Ravenswood, among others). First, there is the immediate focus on defining a maiden near-surface JORC resource and getting a scoping study completed. Secondly, you are looking for the ‘big one' - another multi-million-ounce gold system with the same characteristics as the neighbours. 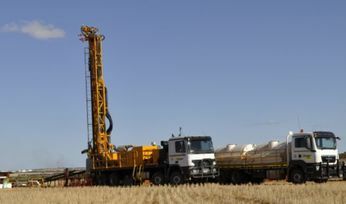 This week you've put out results of ongoing drilling. What have they added, firstly, to the JORC resource drive? Tony Schreck: The ‘parallel exploration' strategy is certainly working in our favour. The widespread, near-surface gold mineralisation we have intersected at our five main prospect areas represents leakage veins typically associated with large intrusion related gold systems nearby. It's positive in that the near surface resource is being generated from drilling required to open up the larger intrusion related targets. The recently released near-surface high-grade gold intersections (3m grading 10.9g/t gold and 2m at 14.8g/t gold) will certainly contribute to the near surface resource, but it is the drilling currently underway across the northern half of the project which we believe has the potential to significantly boost our near surface gold inventory at Triumph. We have only recently been able to gain drilling access to multiple-kilometre-scale gold targets and are very excited about the gold bearing potential of these areas. RS: What are you seeing, further, in the way of similarities to other big, regional models? TS: Our most recent announcement was titled, ‘Gold system continues to expand', and that best describes our path ahead. With drilling access to the northern half of the project we are now able to demonstrate that the 15sq.km Triumph gold camp is of a scale similar to other large gold deposits in eastern Australia. The zoned alteration and zoned metal associations is one of our key targeting tools that point towards the nine intrusion related gold centres as being the main drivers behind the widespread high-grade gold leakage, or ‘smoke', around each of the centres. I see the most compelling deposit type similarity to be the Mt Wright Deposit (1.3Moz) in Queensland, where zinc (-Au) mineralisation halos sit immediately above the Au-Cu deposit below. The zinc mineralisation halo to the main gold deposit is quite common with Intrusion related gold systems, particularly in Queensland. RS: You've got at least five priority target areas returning strong, near-surface grades in drill intercepts of good width - 10m or more. You've just done another 36 RC holes to an average 45m depth, for 1,630m, on Big Hans, Bald Hill and Advance. What is that, and the evidence of historic mining and exploration, saying about the scope and scale of the mineralised (gold, silver, zinc) ‘system'? TS: I think the salient point here is that we have only tested a small portion of the 15sq.km gold system which is dominantly masked by shallow cover sediments. Our drilling success to date has come from five priority targets each of these outcropping with historical workings. Our system-wide geophysics with supporting geochemistry (bedrock) provides further support that we have been intersecting the upper parts or leakage above a very large intrusion related gold system, or systems. It has been a journey of discovery so far, due primarily to the large scale of the gold system we have uncovered and I believe we are very close to unlocking significant value at Triumph. 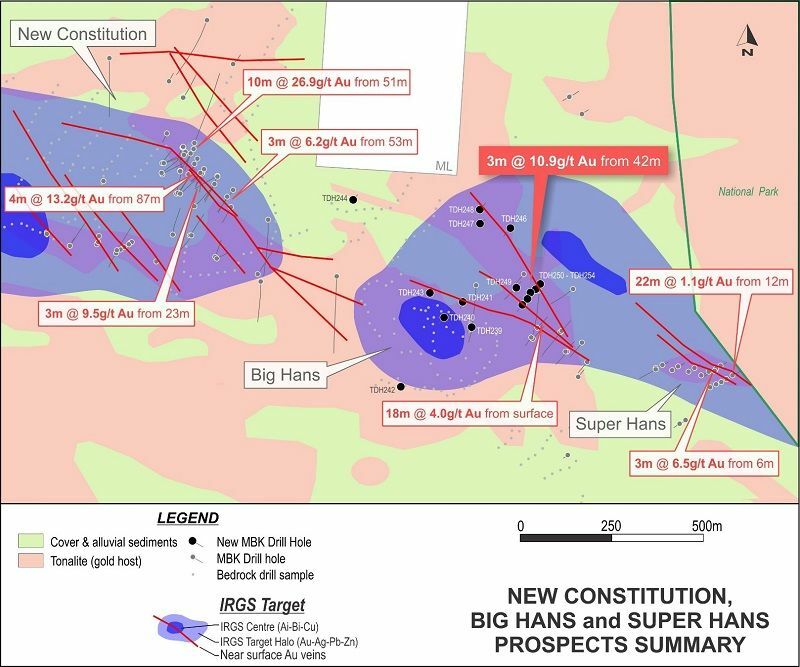 RS: The target area between Bonneville and Bald Hill East, which is the focus of 1,500m of current drilling, could "substantially increase near surface gold inventory on the project". Why is this area significant and what can you say about any historic activity there? TS: This target covers a large portion of the northern half of the project which is almost completely covered by shallow sediments (less than 5m thick) concealing the basement rocks from historical mining and prospecting activities. 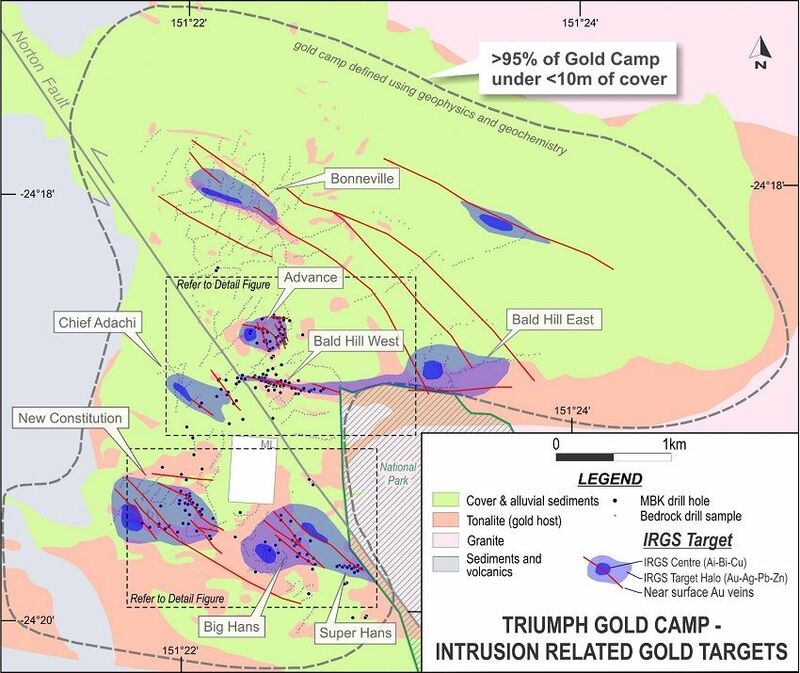 The historical prospectors were very successful in locating outcropping high-grade mineralisation within the Triumph Gold camp, but less successful in the areas of shallow sediment cover such as that between Bonneville and Bald Hill East, which mask 90% of the large gold system. Airborne magnetics is one of our most effective tools used to identify prospective structures and alteration beneath the cover. Multiple-kilometre-scale structures are clearly recognised in the geophysics extending from Bonneville (in the north-west) to Bald Hill East (in the south-west). What makes these multiple large-scale targets most compelling is at one end we have rock chip float results up to 255g/t gold (Bonneville) and at the other end we have a large ‘open' soil gold geochemical anomaly 500m long, more than 100ppm gold in soil contour (Bald Hill East). As far as an undrilled target goes, that for me is about as good as it gets and why we believe there is scope to substantially increase the near-surface gold inventory. RS: In terms of the near-surface mineralisation being consistently drilled, what is encouraging you from a mine planning perspective? TS: From a mine planning perspective, I would most definitely say, ‘mineralisation extending to surface or close to surface', where shallow historical gold workings exist, would certainly be the standout. The average hole depth from drill programmes completed over the previous six months has been 30m, so it is only the very upper parts of the gold mineralisation that we are looking at in terms of the multi-pit mining scenario. RS: And from a processing perspective? TS: We have commenced some initial metallurgical testing which is focusing on a simple gravity separation circuit to create a gold concentrate. If met results support the use of such a circuit it would be an important step towards developing an open pit mining operation. The project is located only 80km south of the industrial hub and commodity export port of Gladstone which has a well- established mining services industry to support any development. RS: How far away is the initial JORC resource estimate? TS: We are currently drilling new large-scale targets across the northern half of the project that have the strong potential to contribute significantly to a maiden JORC resource. We are confident these targets are ‘live' (mineralised) so I expect we will need to complete shallow infill drilling as part of the JORC resource estimate process. We have a very reliable and efficient drilling contractor and if required the contractor has access to multiple drill rigs in order to fast track this process. RS: You've talked about the hunt for a bulk-tonnage, intrusion-related gold system that could be the ultimate project driver at Triumph. What is the current drilling adding to that search? TS: The recent bedrock drilling has been the big breakthrough on the project highlighting nine centres each with near-surface high-grade gold mineralisation interpreted as leakage from underlying intrusion related gold systems. The current drilling focussing on bedrock geochemical anomalies across the north of the project will provide important initial metal and alteration zoning data to target the intrusion related gold system and also intersect near surface ‘leakage' gold mineralisation at the same time. A complete review of the nine intrusion related centres in underway. We have engaged the services of a leading intrusion related gold consultant to assist with this review and help identify the highest priority targets. RS: What can we look forward to in the way of new drill results and project development milestones over the next few months? TS: As we work towards the multi-openpit mining scenario, the next exploration milestone will be the RC drilling results from the 1,500m programme taking place across the northern half of the project. These targets have upside to significantly increase a near surface gold resource and will likely require additional infill drilling to achieve JORC resource estimate status. As these new targets may well provide substantial additions to our resource base, the release of an initial JORC estimate will be delayed until we have received the results from this drilling. Positive initial metallurgical test results on gold ore samples could demonstrate a simple gravity circuit recovery of gold into a concentrate which could then be either further beneficiated on site or exported out of Gladstone port as a high-grade concentrate. This outcome would contribute very positively to the economics of a multiple-openpit development scenario. Unlocking the big intrusion related gold system or systems on the project remains our primary focus and the outcome from the project-wide review, in conjunction with a leading global intrusion related gold consultant, will provide a very significant step closer to achieving that goal.